Benefits Lung, calm asthma, stop chronic cough due to Deficient Lung Yin, sedates coughs. Cough caused by pulmonary weakness, expectoration aemoptysis, chronic cough without mucous, asthma due to weak Deficient Lung Qi. In cases where cough has been neglected or treated improperly or if its treatment is postponed too long or administered inadequately, the lungs will be affected, leading to bronchial asthma, expectoration and haemoptysis. Other symptoms, such as aggravated forms of fever and nightsweats may also develop, resulting in debility tachypnea, lassitude and lack of well-being. These tablets are prepared with indigenous herbs, which have been selected and refined by a special scientific process. It is effective in promoting the health of the throat and in supporting pulmonary functions. Other Ingredients: Talc, cornstarch, alcohol and colored with carmine. 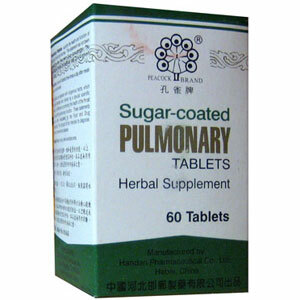 Benefits Lung, calm asthma, stop chronic cough due to Deficient Lung Yin, sedates coughs. Cough caused by pulmonary weakness, expectoration aemoptysis, chronic cough without mucous, asthma due to weak Deficient Lung Qi. For adults, take 5 tablets, 3 times a day. Do not use with asthma due to Heat and Dampness where there is Lung Heat and the patient has problems breathing.